We all knew it was going to happen and the time is coming soon. The border is going to reopen to allow Canadian cattle to come into the US. You might remember I discussed that Canada still has problems with their feed production and could still be feeding animal parts to cattle which spreads BSE. I sure hope they know what they are doing. Again I fail to understand. Schweitzer proposed spending $2.96 billion on his general fund budget over the next two years, for an increase of $45 million over the total general fund budget proposed by departing Republican Gov. Judy Martz. The general fund is like the state's checking account, with most of money coming from taxes and state investment income. Schweitzer proposes nearly $80 million in new general fund spending over the next two years and the rest of the current fiscal year, which ends June 30, 2005. His recommendations will go to the 2005 Legislature for consideration. Martz's recommended surplus was $163 million by mid-2007. Schweitzer's budget calls for leaving a projected $80 million general fund surplus as of mid-2007, although it is now $94 million. Schweitzer proposes to spend down the surplus to $80 million through a pay increase for state employees that is yet to be negotiated, more money for water adjudication and other unidentified programs. I understand that a new regime has taken over and needs to put its stamp on things to feel important but this makes it sound like by just spending more money they think they are automatically doing a better job. Spending more money doesn't mean they are doing a better job, it just means they are spending more money. Continuing on his "New Day in Montana" theme, Schweitzer said, "This New Day budget reflects my vision as we begin to move Montana forward. Good-paying jobs, quality public education and stronger families are my priorities for the state." Reading the article the only place the budget helps in these priorities is good-paying jobs, as long as your employed by the government. The 2003 Legislature froze state employees' pay for 18 months, and most employees will get a 25-cent an hour increase, starting Saturday, for the final six months of the two-year budget period. The Martz administration proposed matching 3 percent raises in each of the next two years. State employee unions, which backed Schweitzer for governor, want to resume negotiations after the Democrat takes office. Ewer said the administration wants to offer more than the 3 and 3 percent raises, but that will be up to negotiations. The government is not the only employer in the state nor should it be. By automatically offering them higher wages you are ensuring their support in future elections. Pretty savvy I guess if you are looking at the long haul. It really bothers me the assumption that spending more money is good. Can anybody explain to me how this is automatically good. In my business I try reduce my expenditures. I realize that business and government are two different beasts but some things still apply and spending money for spending sake is not one of them but that's the joys of our form of government. Buying off voters. Now here is sight that in the middle of summer can really get a persons heart going. Hell, even in the fall as dry as it a sight like this makes you worry. The problem is it is not a fire. they are blasting at the Sarpy Mine. 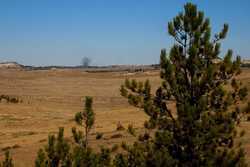 Whenever you see a black cloud in that direction in the summer you have to wait and see if it is a fire or the mine blasting. Usually you know it's the mine because of the time they blast but sometimes they change their schedule and take a person by surprise. Taken 11/2/2007.